Festival season 2019 is finally upon us, these days it seems like the only problem is there are literally too many incredible festivals with equally amazing line ups. But there are a handful of these magical journeys we all go on year after year that stand out and become a part of life, they become home. Shambhala Music Festival is without a doubt a one-of-a-kind experience that is a totally unique experience. 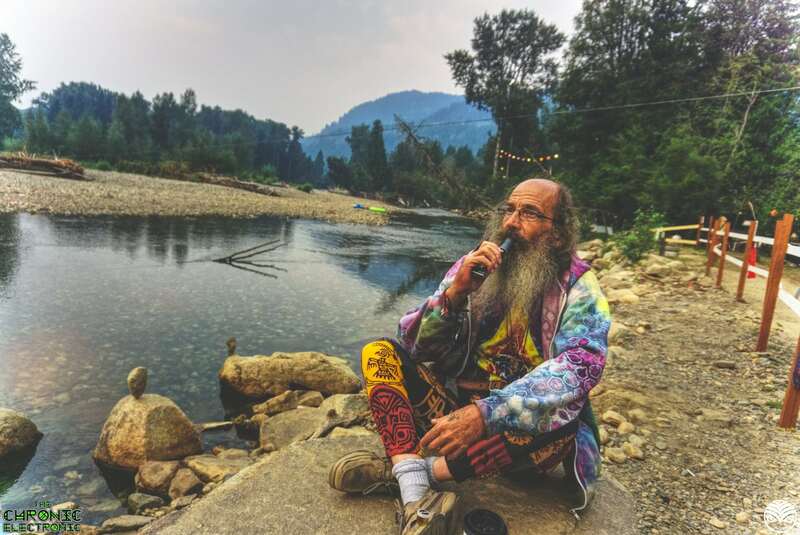 Nestled deep in the Salmo River Valley of Canada’s province of British Columbia is the 500-acre farm known as the Salmo River Ranch, well at least that’s what it is for most of the year. For 5 days this wonderful farm is transformed into an art and music filled paradise known as Shambhala Music Festival. 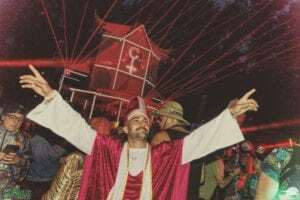 They do not accept any corporate sponsorship and each and every year make every part of their beautiful vision a reality, every single aspect of this festival is actually just delightful. This is especially obvious in the artists that get booked to play on the six different individually managed stages inside this surreal city. Earlier last week the internet was completely floored by the first phase of artists Shambhala dropped on us after being teased for a few weeks. Gracing the pristine Salmo River Ranch this year are some of the biggest and quite frankly the best names in electronic music. First none other than the infamous Canadian duo Zeds Dead, just thinking about that set gives us chills. Recently releasing a 30 song album and finishing up his tour none other than Liquid Stranger will be sure to keep things nice and saucy. Perhaps you’re just looking for a little funk in your life, something you can just jam to? Well, Zhu and Griz are also going to be headliners. As if we weren’t already sold, other massive names like Ganja White Night, Kaskade, Nero, Rusko, and Excision will be joining us on this life-altering journey. Those were just the headliners… Considering some of those “smaller” names include names like Charlesthefirst, Ivy Lab, AC Slater, ILL.GATES, Minnesota, Mala, Mija, and well you get the point. There are literally 0 flaws in these artists that were announced, and considering there are 200+ more to be announced we would HIGHLY suggest getting your tickets and start making plans as soon as possible. Get your tickets at the link below and make sure to follow their socials for more news! We have over 300 songs on a girthy Shambhala playlist with all the artists listed on the lineup so far with 4 songs or so from each artist. Check it out below and share it if you dig it! 25 Hours of funky, bass heavy, peaceful, groovy, Shambhala goodness in a playlist to amp you up over the next months. 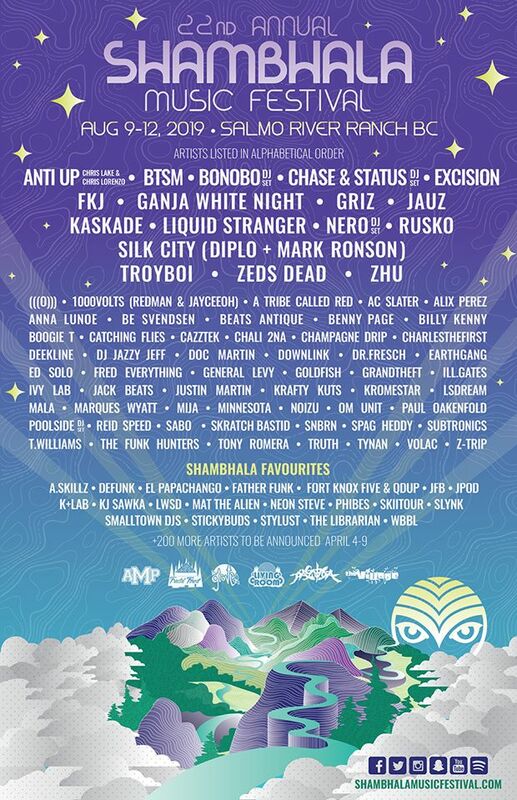 We at The Chronic Electronic sincerely hope to see you all on the glorious farm for Shambhala Music Festival. This entry was posted in Event Media, Music Festivals, Music Reviews, News, Previews & more, Upcoming Artists and tagged Billy Kenny, Dubstep, EDM, Excision, FKJ, Funk, Ganja White Night, GoldFish, Groovy, House, Liquid Stranger, Nero, Playlist, Shambhala, Shambhala Music Festival, Zeds Dead. Bookmark the permalink.